How is this oil line routing? I didn't like the fit of the stock hard line from the case around to the 2-part line from the thermostat so I fabbed this up from -12AN racing hose and some fittings. I'm not 100% convinced on the routing but its the best I could come up with. Its sort of an important line being that a break would dump all my engine oil in moments. Its an aluminum oil line to -12AN adapter in the case (actually for oil coolers), -12AN 90 degree elbow, -12AN racing hose rated to continuous 300f and 1,000 psi, and another -12AN to 30mm adapter at the other end (yes, I know its not tightened down in the pic). I've got it in a WG16 Adel clamp so its not going to flop around at all. However, it does cross and rest on the exhaust as you can see. It crosses as close to 90 degrees as I could make it, and doesn't run parallel to the exhaust anywhere so it as as little proximity to the exhaust as possible. But short of running it around the front of the engine there's nothing better I can do. 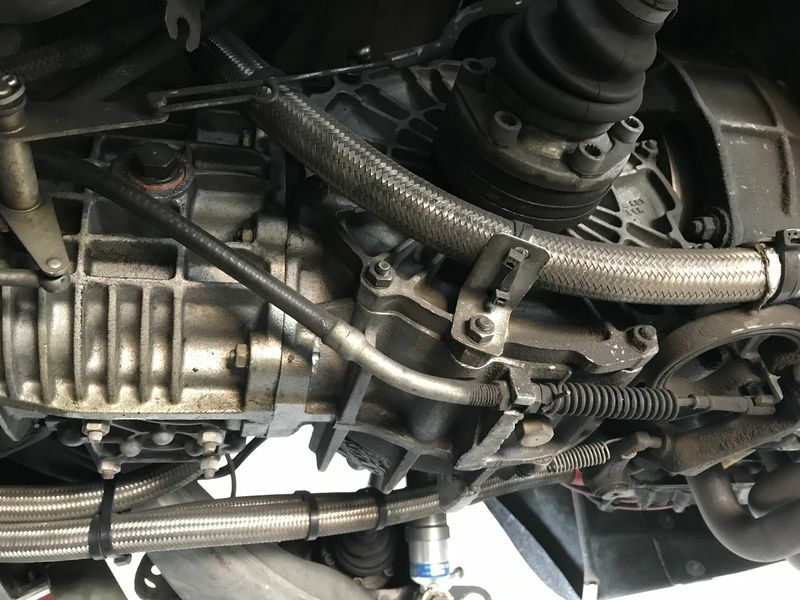 It does also rise then dip back down a little as it wraps around the heater hose, but running it inside the heater hose would have caused interference with the lower valve cover. Thoughts? Is this an acceptable installation? Why don't you follow the original route? 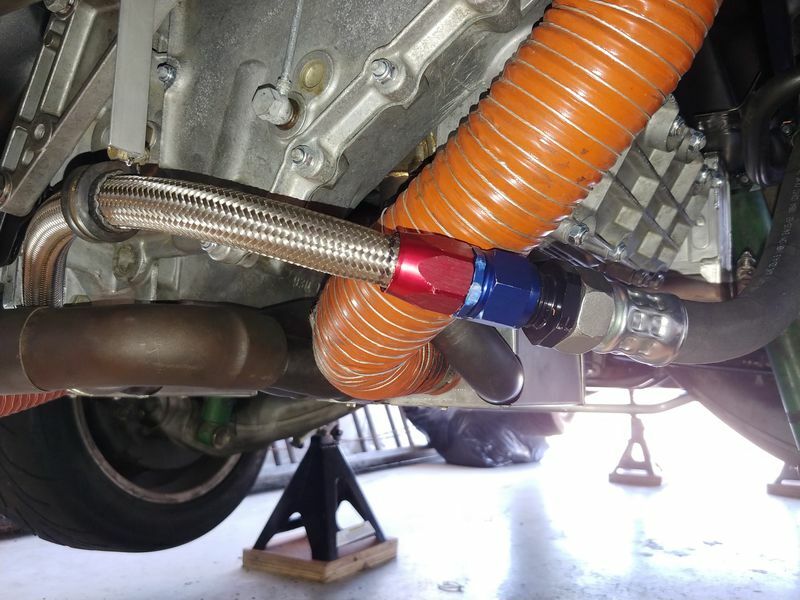 I would be concerned about that hose being against the headers. 300 degF is bugger all compared to the 1500 deg F you get on the headers. The original route is under the headers, and there was damage to the line from ground contact or something. Also the hard line runs parallel to the headers for at least 6-8" around the rear of the motor. Also I had to jigger around the exhaust and just couldn't get it to fit correctly. my hard line tracks foward and over the bellhousing area. Away from the headers. I am sure it is stock. My SC is same. Have the 930 on hoist at moment. Would take a pic, but no camera right now. 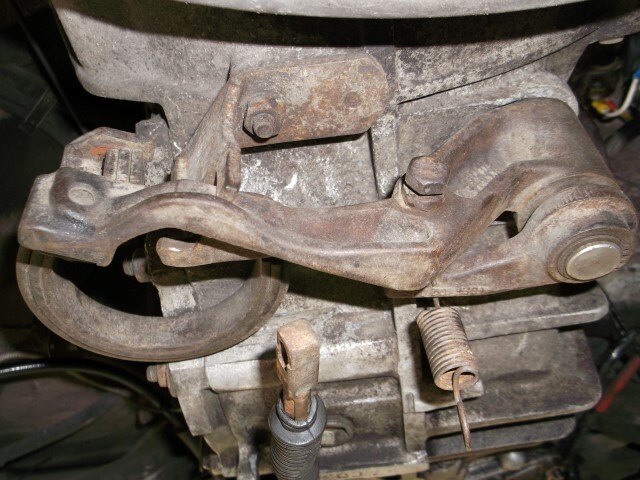 Yo FL, it there room there to attach a hose clamp, or similar, to the headpipe and then make a small standoff for the oil line? 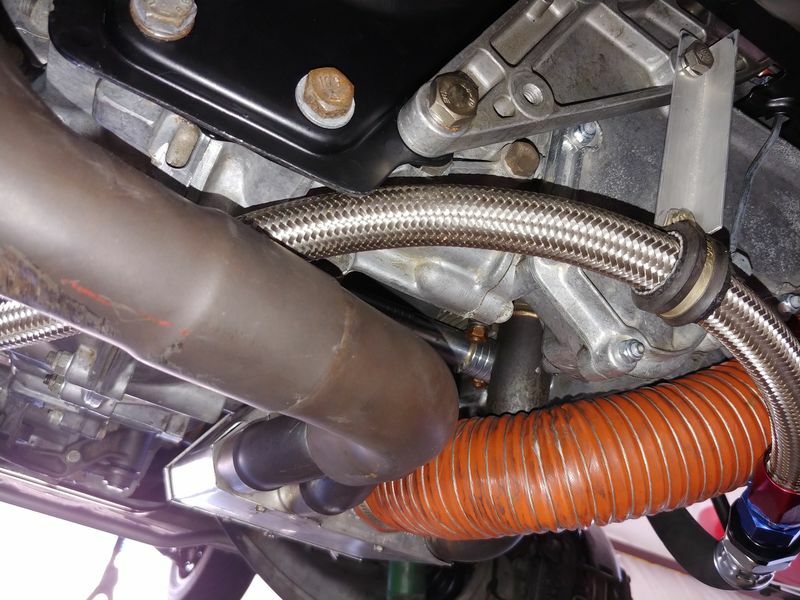 If not, maybe you could use a piece of high temp tubing sleeve over the hose, in the area where it's mading contact with the headpipe. You really don't want that oil hose in direct contact with the pipe - could possibly coke any oil, or oil film, that's in it after shutdown . . . even as little as a couple millimeter air gap would be sufficient (or insulated from contact if no air gap is possible). 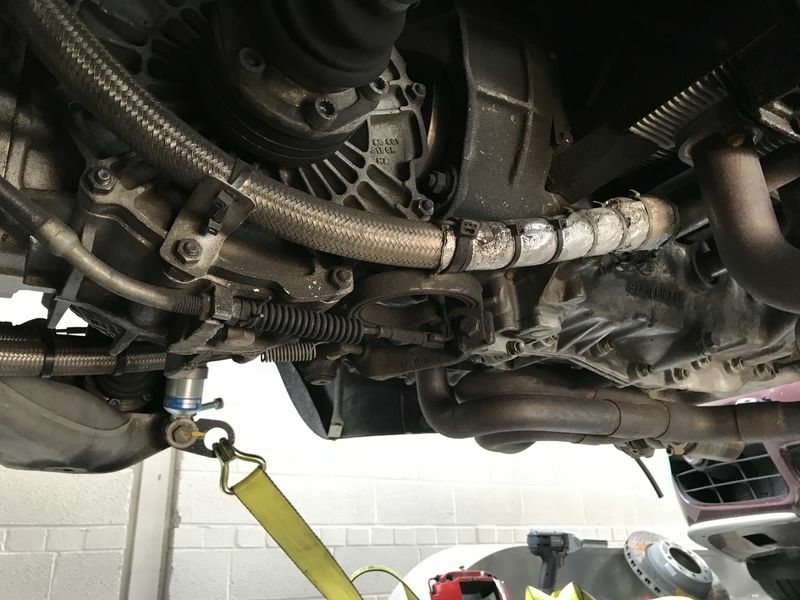 Last edited by Rawknees'Turbo; 03-24-2019 at 05:30 PM..
Just to confirm the route of my solid tube - from the crankcase pick up it goes fowards and wraps around under the bellhousing. Not the best pic - taken for the clutch assembly, but tube is at very top of pic. 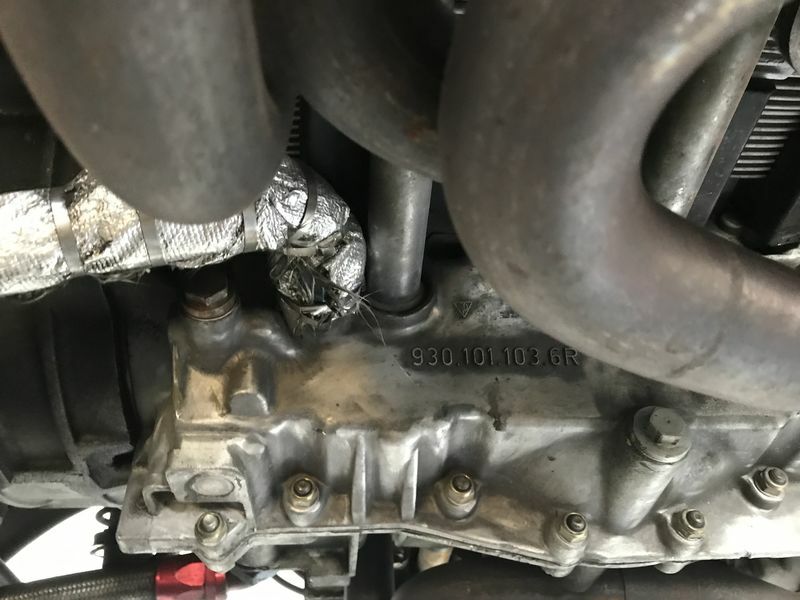 Porsche changed that in the mid 1980s (at least for Turbos) to a hard oil pipe that runs along the back, bottom side of the engine and then connects to the oil hose seen in FL's last pic. I have enough hose to fab up another if I need to. I'll have another go at it this weekend. Absent an alternate choice for routing, I think I'll make a curve piece of mild steel with some "legs" and simply hose clamp it to the exhaust there to give myself maybe 1/4" or so airgap. 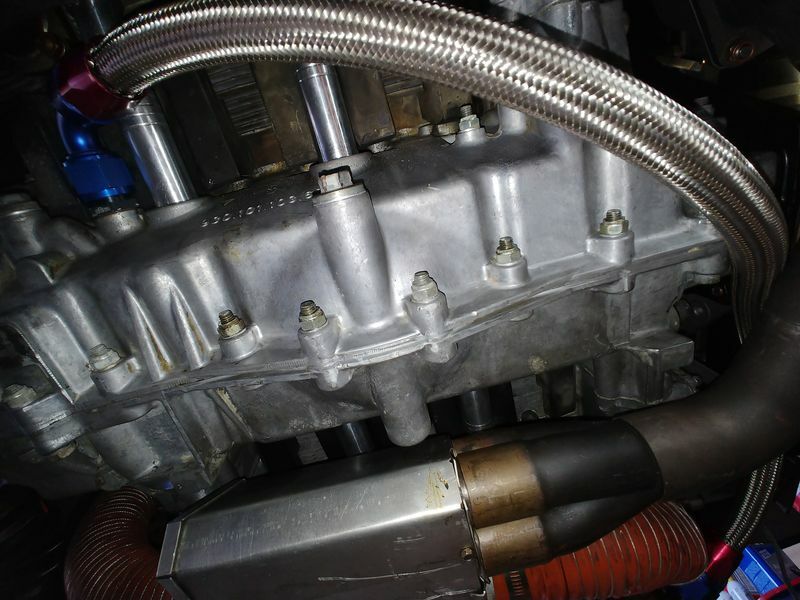 Given the critical nature of that hose, I would be somewhat nervous about having a flexi hose so close to the headers. For peace of mind is there any way it will route the alternate way? You mean around the front of the engine? Not and easily mate up with the line from the thermostat. I'd have to fab up the entire run. I'll look at it, but not sure how viable that is. The stock hard line runs across the headers and also runs parallel to them much more than this line, and the hard line will conduct heat to the oil much more. However the braided steel over rubber line itself is more susceptible to heat. yes, it is not so much the heat in the oil I am thinking of. My catch can for the turbo is very close to my headers. But I am thinking of the heat accumulation on the flexi hose. Having it in such close proximity to 1500 def F constant heat. It must soak a lot of that heat up. The oil may heat up somewhat, but the heat has to have been conducted thru the flexi tubing first, to do that. And that is the bit I would be concerned about. A single event may not be the issue either, but the constant heat stressing of the rubber internals would be my worry - fracturing etc. Bear in mind the oil is already around 200 deg F, so you only have 100 deg F headroom with the hose right against the headers. It must be at or beyond its continuous rating. I went forward and over the top of the transmission. To stay as from the heat as possible and in all of the dirt you will see my heat wrapping .... looks like I should clean things and redo that wrapping. Has worked well for 4 track seasons - I guess that explains the dirt. With headers the solution was to use a 74 crossover, great fit. ER has one runs over the top as well. Is the fitting size on the thermostat the 30x1.5mm convex fitting? $50 for an original under the bell housing line.